When I was a kid, I used to hate peas. It had to do with eating them from a can–they taste so utterly vile and wretched that way that I cannot blame my younger self for despising them. And then, even when the peas were fresh or frozen, through most of my childhood, they were overcooked. To this day, I cannot even abide the smell of overcooked peas. The only way I would eat them when I was a kid was raw, straight from the vine. Now, of course, that I am an adult and can avoid canned peas and cook whatever wee green legume that comes my way as little as I want to, I adore them. They are sugary sweet and filled with the verdant breath of spring. They pop in your mouth when you bite them, unlike the sad olive drab little canned things that just lay there and squish against your teeth, extruding mushy innards in an unappetizing drizzle of goo. So, now that I like them, I keep trying to find new ways to prepare them, new dishes to add them to and have found that I particularly love them in curries. 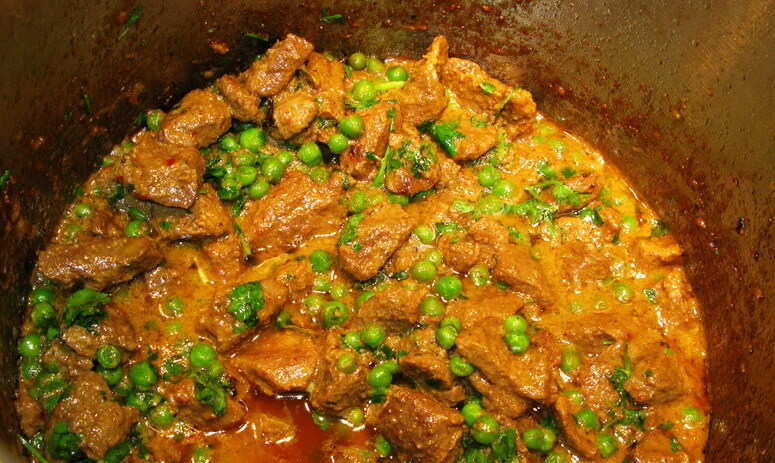 Which is why I chose this curry–Creamy Lamb Curry with Peas as the first recipe to test from 660 Curries. This is an easy dish, where the lamb is marinated in yogurt mixed with ground chilies, turmeric and a paste made from fresh ginger and garlic for a period of time. 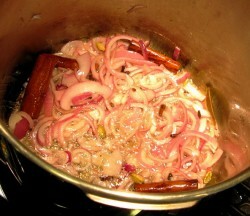 Then, onions are cooked in oil, with whole spices, and the lamb is added, marinade and all, to cook until it releases its juices. Then, it braises in its own juice until it is nearly done. Then milk solids or cream are added, along with peas, and the dish is cooked to an intensely flavored, creamy, rich finish. The original recipe specifies the use of khoya, which is milk solids. It is what you get when you boil milk, stirring the whole time, over medium heat, until all of the water boils away–only the solid fat, protein and sugar are left. Khoya is the basis for the northern Indian milk-fudge sweet called barfi or burfi. It is made from milk solids, sugar and usually ground up nuts and flavorings. Making khoya is easy, but when I tested this recipe, I didn’t really have the time or inclination to spend a half hour simmering the water out of milk, so I used the author-suggested substitute–heavy cream. The next time I make this recipe, I will make the khoya, photograph the process and post about it, because as he says, khoya is a great way to enrich a creamy sauce without all of the fat of heavy cream. The only other change made in the ingredients is I added about four cardamom pods, and used more peas–1/2 cup more to be precise. I also used a pressure cooker, because I am impatient. However, I will give the instructions as written by the author for those who do not have a pressure cooker. One interesting thing I noted about this recipe is that Iyer specifies that the cook use red onions. He seems to specify the use only of red onions in his dishes–he says that in India, red onions are preferred, but I wonder if that is a regional preference on his part. The northern Indian and Pakistani cooks I learned from preferred yellow onions, saying that red onions were too juicy and sweet to cook with. 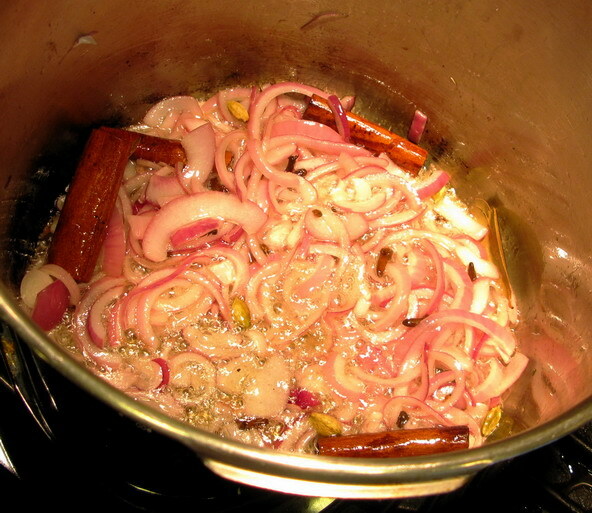 They saved red onions for raw garnish, chutneys and the like, or used them barely cooked for their color, while yellow onions, well browned, contributed the flavor base to the dish. 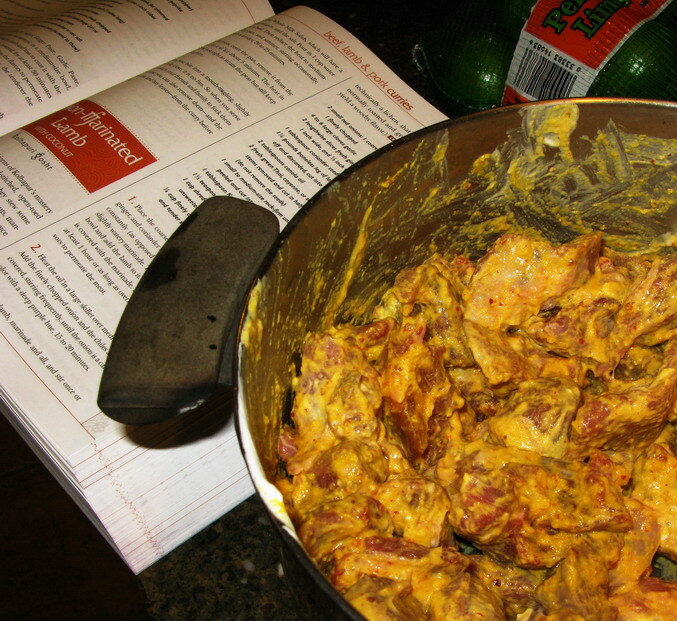 Mix together the yogurt, ginger and garlic pastes, the chilies and turmeric in a medium sized bowl. Add the lamb and toss well to coat. Cover and refrigerate for at least thirty minutes to overnight in order to allow the flavors to perfume the meat. Do not leave longer than overnight as the yogurt will tenderize the meat and you do not want the meat overtenderized and mushy. Heat the oil in a large, heavy-bottomed dutch oven or soup pot over medium high heat. Add the whole spices, and cook, stirring until they sizzle, crackle and release their fragrance–about thirty seconds. Add the onion and cook until it is softened, stirring constantly. Keep cooking until it lightly browns. Add the meat and the marinade, and cook, stirring, until the meat starts to release its juices. At this point, it is essentially braising in yogurt and its own juices. This will take ten to fifteen minutes. If you use the whole milk solids, add them with 1 cup of water. If you use cream, just pour in the cream and about 1/4 cup of water. Add the salt. Bring to a boil. Turn heat down and simmer, covered until the lamb is tender–about twenty to twenty-five minutes. Stir in the peas, cover the pan and turn off heat. Let pan sit covered off heat for five minutes to barely cook the peas–this way they retain their brilliant color. Serve over rice with a garnish of cilantro leaves if you like. Someone from Indian can correct me if wrong, but I believe the red onions we have here are more similar to the onions found in India. The onions I have seen in India, are smaller than our red onions, but look a bit the same. Our “yellow onions” are different apparently and have a different flavor. I have also heard many Indians say our vegies are more watery than theirs, so maybe that’s another issue he’s hoping to avoid. I don’t think it matters all that much though, and would use any onion at hand except “sweet” onions. I know that most of our onions are wetter and juicier than Indian onions–not only has every Indian cook I have spoken with remarked upon it, a number of cookbook authors mention it too. Which is why the Pakistani and Indian friends who helped teach me to cook Indian food used yellow onions–not the sweet ones (which they loved in chutneys and as raw garnishes), but the dark yellow skinned ones which they said were drier. Some red onions are pretty wet, I must say–generally the larger ones. The smaller ones tend to be less juicy–those are the ones I used in this recipe and they turned out nicely. Although, I have found that smaller onions tend to be less juicy in general–smaller yellow onions tend to have less juice than the larger ones, too. I have to admit my favorite onions for Indian food are the locally grown, fairly small ones we get in the late summer here in Athens. They tend to be nice and dry and have a lot of zing to them and they brown up beautifully. Barbara: I think you are 100% correct. The Indian onions are a lot smaller, so maybe the smaller red ones, or local red ones are more similar and dryer. I can’t WAIT to get this book. Just bought Karl this cookbook for his birthday based on your writing about it! Kindly click on the link below. There is something for you there, a way to express our appreciation. 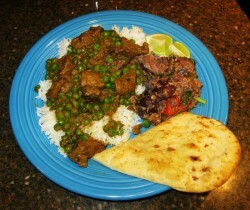 I made this tonight – but the version from “From Bengal to Punjab,” made with ground lamb and no cream – not this version. I also made fresh chapatis to have with it (chapati boot camp is on again this summer), and it was a heavenly dinner. I do love lamb. The onions we use at Nandyala and in Andhra Pradesh are actually shallots that I see in Vietnamese and Thai grocery shops. Not the tiny, bulb like single shallot. But little bit bigger, two or three attached together, that kind of shallot. They are about the size of small onion. I love this book. I’ve made three recipes from it already and loved all of them. A question about khoya — would evaporated (not sweetened condensed!) milk be another possible substitute? If I understand the process correctly it seems like it’s halfway to khoya, and much lower in fat than heavy cream. I think Andrea is right about the evap. milk. I’ve heard it recommended as a khoya substitute by friends who cook lots of Indian food. One disappointment re: the recipe, though. Canola oil?? Yuck. How about some ghee instead? Isn’t that more authentico? Just yesterday I took and Indian cooking class and the teacher insisted on red onions, saying they are more like the ones in India, but he didn’t give any details. I keep hearing about this book 660 Curries. Do people who own it recommend it??? FYI – in class yesterday, one instructor said that there were something like 39,000 different curries in India! Could powdered milk serve as a substitute for khoya? I use it when i make yogurt/yogurt cheese for added thickness and richness without wetness. Trying to learn how to make Rabri. I found many recipes suggesting bread in the ingredents or Khoya. They sound kinda odd. Do anyone has a copy recipe for Rabri? hi, I know this is an older post…but where do you get your Kashmiri chillies?